To kick-start their A-Level Tudors unit, 30 History students travelled to Bosworth Heritage Centre to discover more about the victory attained by Henry Tudor in 1485. In hazardously windy conditions, Eddie the Tour Guide allocated roles determining which side students were on: York or Lancaster. With flags donning the various house sigils, students marched up the hill where thousands of soldiers had gathered on the fateful August afternoon. They discovered that most soldiers were little more than untrained peasants, many of whom were ill equipped for war. Important nobles such as the Earl of Northumberland and Sir Thomas Stanley continued the treachery of the War of the Roses by becoming ‘turncoats’ with Stanley charging Richard’s army and his brother William slaughtering the Yorkist king with clinical efficiency before defacing his corpse. It was an unlikely victory for Henry Tudor, Richard was a capable and experienced military leader with 12,000 soldiers – Henry had arrived in England with just 5,000 mercenaries and limited battlefield prowess. Yet Richard’s unpopular policies, rumours of regicide and cruel punishments had disillusioned his supporters, not to mention England’s fickle nobility, creating the perfect storm for usurpation. Students were able to study tactics used by both sides, engage in military charging and model the chainmail protective suits the knights wore. What our students lacked in ferocity, they made up for with enthusiasm, however were branded ‘a pile of peasants’ by Commander John! 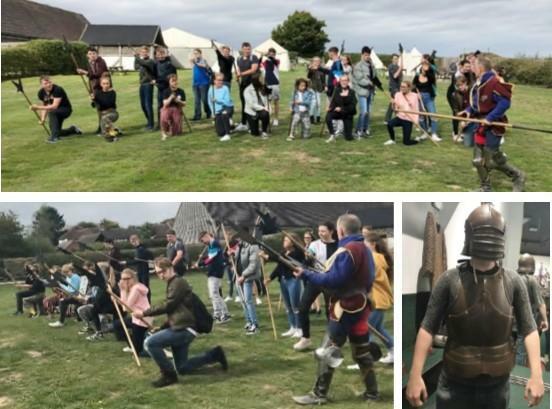 Jasmine Angus commented ‘It was a great day, fun and informative.’ Above all, the next generation of Vandyke Historians were able to gain a sense of context into late medieval England and some insight into the character of Henry VII, the usurper who launched the Tudor dynasty.